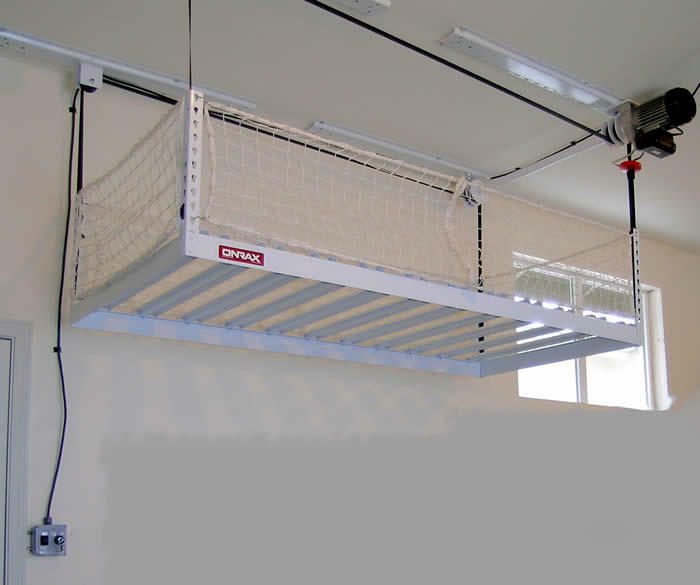 Do you need overhead garage storage but do not want to climb on a ladder? The ONRAX Ascension series is a motorized overhead storage rack that enables the platform be lowered with the touch of a button. You can then easily load or unload the storage rack and return it to the ceiling where it is out of the way. The ONRAX Ascension series utilizes a wall-mount push button station with keyed lockout to prevent unauthorized use. The super duty seat belt webbing provides exceptional strength (1500# break strength) and smooth travel. Safety netting (real netting, not plastic) is provided on all 4 sides to help keep your items on the rack when moving and stored.